Welcome to Bradley Estates, an impressive and well-established community by Valecraft Homes located south of Blackburn Hamlet off Navan Road, backing onto the Mer Bleue Conservation Area. This is a haven for nature enthusiasts with wildlife observation, boardwalks, berry picking and an abundance of nature trails. We have just sold out in Bradley Estates. Thank you to all our homeowners for trusting Valecraft to build your dream homes. 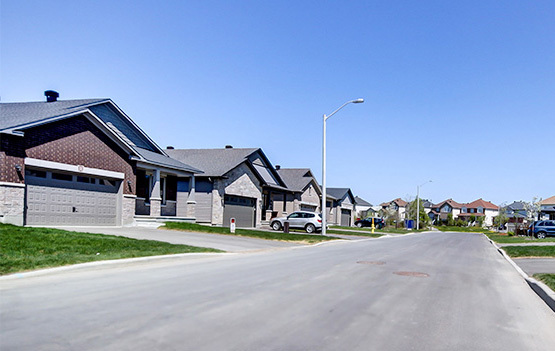 We are building beautiful single homes in Embrun and Stittsville. Enjoy a trip to the Little Animal Farm with the whole family (or your inner child) or explore the Old Barrhaven district and its historical schoolhouse. You’ll also find plenty of schools, and outdoor recreational facilities such as sports arenas. Navigating Barrhaven is a breeze, you have access to the rest of Ottawa by taking one of several major traffic routes or by using OC Transpo services. You’ll also find the Fallowfield Railway Station nearby for easy travel to other major cities. Up for traditional Italian, a scrumptious buffet of exotic flavours, or something quirky and unique for that nip after dinner? You won’t be disappointed by living here, Barrhaven is full of great places to eat and drink! A unique combination of the old-fashioned and the modern, Barrhaven features two brand new shopping centres, big box stores full of conveniences, and plenty of outlets. It’s never been easier to cross everything off your list while staying local! Visit our beautifully finished home decorated by our award-winning interior decorator. For your convenience, we have flexible closing dates.